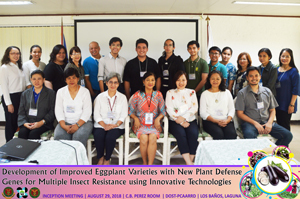 A project funded and monitored by the Philippine Council for Agriculture, Aquatic and Natural Resources Research and Development of the Department of Science and Technology (DOST-PCAARRD) will develop improved eggplant varieties with increased resistance against insect pests, specifically eggplant fruit and shoot borer (EFSB) and leafhopper. The project titled, "Development of Improved Eggplant Varieties with New Plant Defense Genes for Multiple Insect Resistance Using Innovative Technologies," will be implemented by the Institute of Plant Breeding of the University of the Philippines Los Baños (IPB-UPLB), in collaboration with the National Institute of Molecular Biology and Biotechnology of the University of the Philippines Diliman (NIMBB-UPD), University of Tsukuba in Japan, and the Southeast Asian Regional Center for Graduate Study and Research in Agriculture (SEARCA). Eggplant is considered to be the top vegetable crop of the Philippines, and the 16th most highly-consumed crop in every Filipino meal. However, statistics showed that there is low profit to cost (NPC) ratio per hectare in eggplant production in the country. A large fraction of the cost is still allocated to pesticides due to high incidence of infestation of insect pests like EFSB and leafhopper. The five-year project will use genomics, IT-based phenotyping platforms, molecular marker technologies, and new breeding techniques. Dr. Desiree M. Hautea presents the project details during the inception meeting held on August 29, 2018 at C.B. Perez Room, PCAARRD. To discuss the specifics of the project, an inception meeting was recently conducted at the PCAARRD headquarters. Dr. Desiree M. Hautea, project leader from IPB-UPLB, explained the importance of technological advancements toward an era of digital agriculture. She stressed that "the ultimate goal of the project is to increase the income of eggplant farmers through higher yield, lower input costs, and improved product quality." 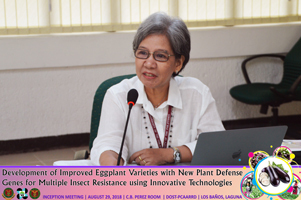 The Crops Research Division (CRD) Monitoring and Evaluation Team for Vegetables organized the inception meeting, led by its Director Dr. Jocelyn E. Eusebio. Representatives from the Technology Transfer and Promotions Division (TTPD), Socio-Economic Research Division (SERD), and Office of the Executive Director R&D Cluster also attended the activity as evaluators.